The students of our Faculty Ivana Radomirović, Sonja Stojčić, Teodora Višnjić, Aleksandra Regodić, Aleksandar Višnjić, Nenad Kalčić, Marko Bogić, Filip Kranjac, Bogdan Šatilin, Stefan Jugović and Ognjen Miladinović (as well as his co-authors from the University of Belgrade School of Electrical Engineering, Vuk Vukomanović and Đorđe Petrović) have successfully participated at the 18th student conference iSLaCo’2018 – `Blockchain, artificial intelligence, robots and law`, which was held in April 2018 at the State University of Saint Petersburg Faculty of Law. A tour of the Faculty building was arranged for our students on April 18th, with a lecture regarding its history, present activities and plans for the future. 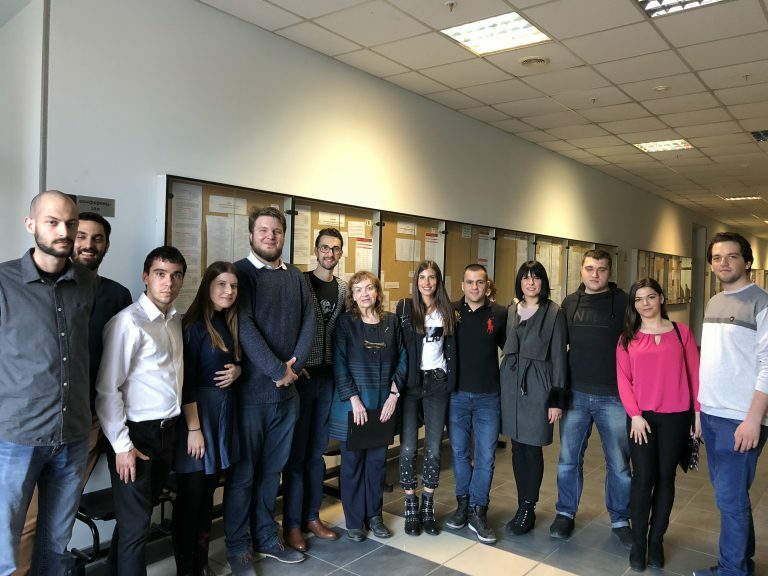 The students also had a chance to get to know the staff of the Saint Petersburg Faculty of Law, and they were also received by the legendary professor of National History of State and Law, Ghenevra Igorevna Lukovskaya (Дженевра Игоревна Луковская). 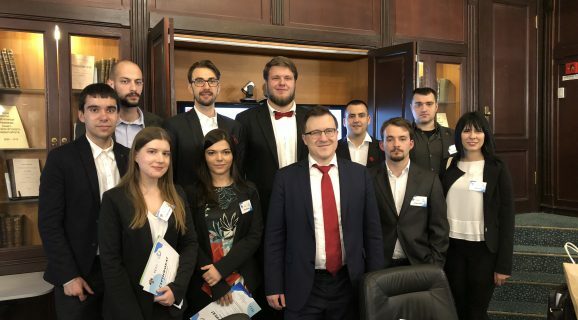 On the next day, the students had a chance to visit the Legislative Assembly of Saint Petersburg (Законодательное Собрание Санкт-Петербурга), while the conference was opened on April 20th. The first conference day was devoted to highly interesting lectures (master-classes) of distinguished professors. On the next day, after another brief lecture in Russian, followed the presentations of student papers, as well as discussion. Every group of students was assigned a mentor, who led the discussions and commented upon all papers, and then every paper was discussed among the other participants. 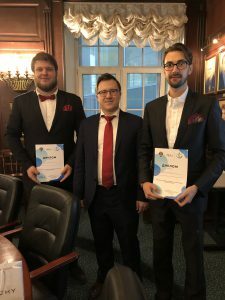 The conference was closed by a certificate award ceremony, which was attended by the Dean of the State University of Saint Petersburg Faculty of Law, Sergey Alexandrovich Belov (Сергей Александрович Белов). During this ceremony, diplomas were also awarded to the best presenters for every of the six scientific areas that were covered by the conference programme. 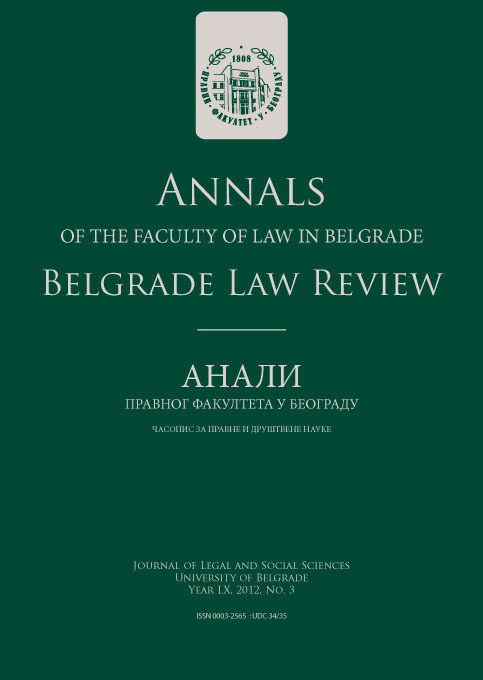 Two of our students received such awards – Filip Kranjac for the best paper in the section `Cryptocurrencies in the focus of law: new financial order or a manipulation?‘, in English, and Bogdan Šatilin for a paper in the panel `Internet of things: regulation for safety and efficiency`, in Russian.